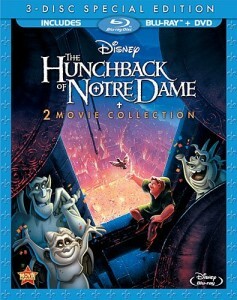 Disney is releasing a blu-ray of The Hunchback of Notre Dame . It will be release March 12th 2013. I’m not sure what features it will have but I can’t say I like the box art. Quasimodo gets lost in it and the gargoyles should not be in the foreground. Not sure why Disney is still forcing the gargoyles on the fans, most people hate them and love the other characters. But I never studied marketing.